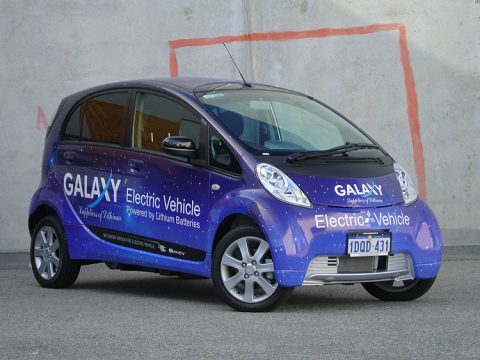 The Mitsubishi i-MiEV is a full electric vehicle and the first production electric car to be sold in Australia. Galaxy Resources approached Perth Graphics Centre to do a vinyl wrap for the tiny EV, and through consultation here is the result. We have included a step by step look at how we create our wraps, so you can see the process. Just click on the article title. It takes a few days to do a wrap properly, but the result is well worth it. 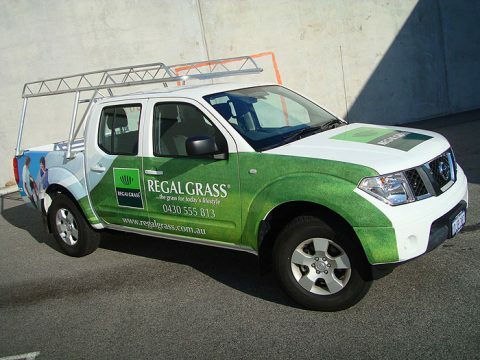 If you’re after a vinyl wrap, Perth Graphics Centre will be happy to supply you a quote. Simply head to our contact page to email us. If you’re after a vehicle wrap, Perth Graphics Centre is here to help. With our team of designers and fitters, we can achieve designs that match your corporate look while still fitting into the dimensions of your vehicle. 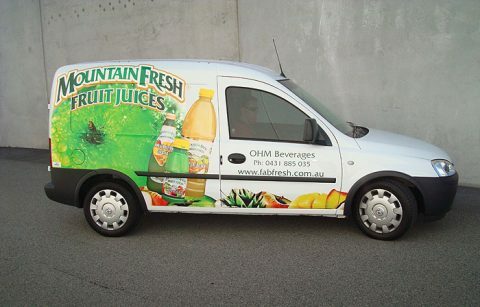 Here is a partial vehicle wrap done on a Holden Combo, and we’ve successfully translated the Mountain Fresh Juice brand onto the mini van. Using professional heat-set techniques and high performance solvent based inks and vinyls, we can follow contours and wrap into recesses to create continuity. If you’ve got a small or large van, or even a truck, bus or car, we can ensure your logo and brand get their message across. Call us for a quote today. 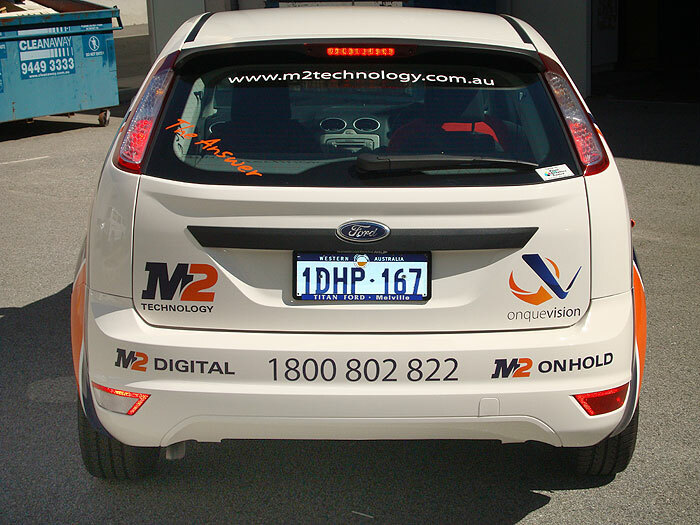 Perth Graphics Centre was contacted by M2 Technology about signwriting their Ford Focus, and through consultation with their graphic designer, we were able to achieve the above result. 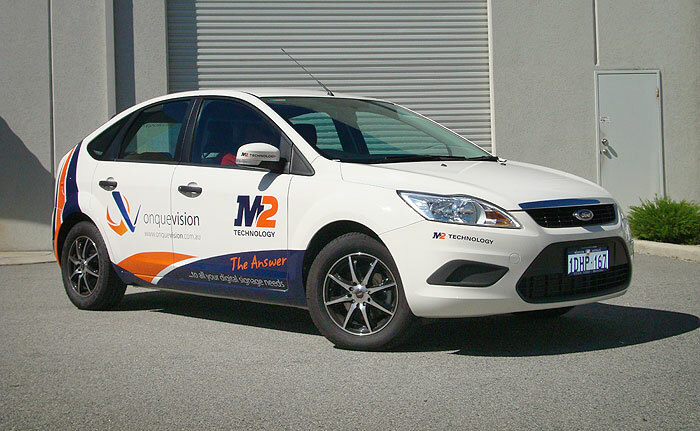 Two custom colours were required to keep M2 Technology’s colour consistent, and so digital print was chosen as the best way to achieve this look. We used our solvent-based digital printer to print onto a high performance cast vinyl and then overlaminated for protection. This gives the longest lasting job as well as the greatest colour consistency. 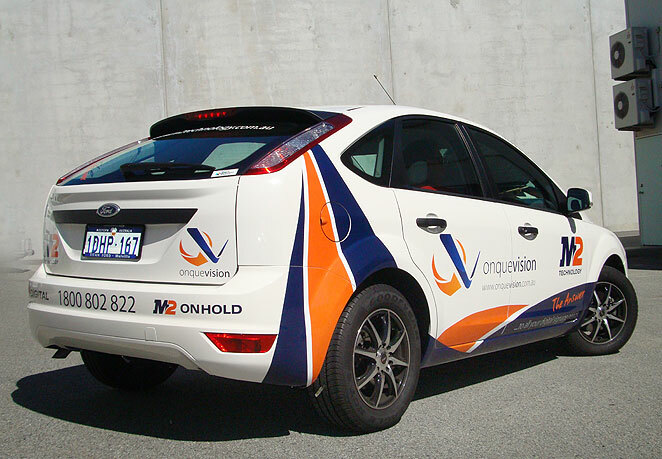 While you couldn’t call this a full vehicle wrap or even a half vinyl wrap, it still requires the same fitting skills and the greatest attention to detail to make this Ford Focus look as good as it does. 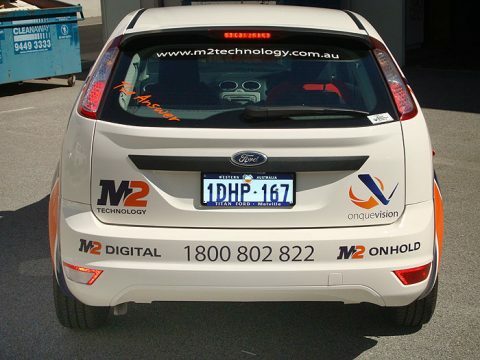 If you’re looking to do signwriting on your Ford Focus, Volkswagen Golf, Hyundai i30 or even signs for a Holden Ute or Ford Ute, then give us a call or head to our contact page. 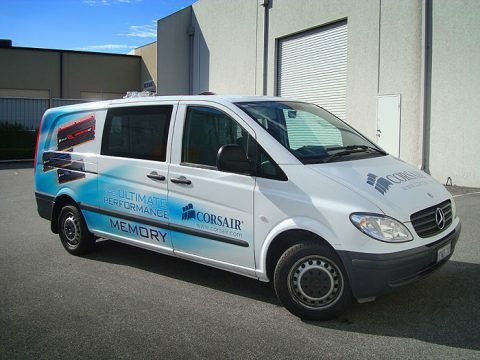 Another vehicle ideal for a digital print half wrap is this Mercedes-Benz Vito. Finished in white, there’s plenty of surface area to cover, and if you want to keep costs down, then a digital print half wrap is the way to go. 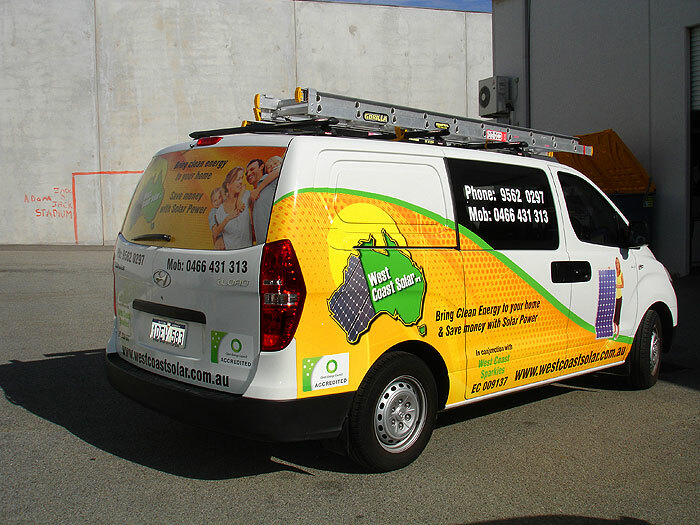 Vehicle wraps are cheaper than a billboard, and much more cost effective than a Yellow Pages advertisement. 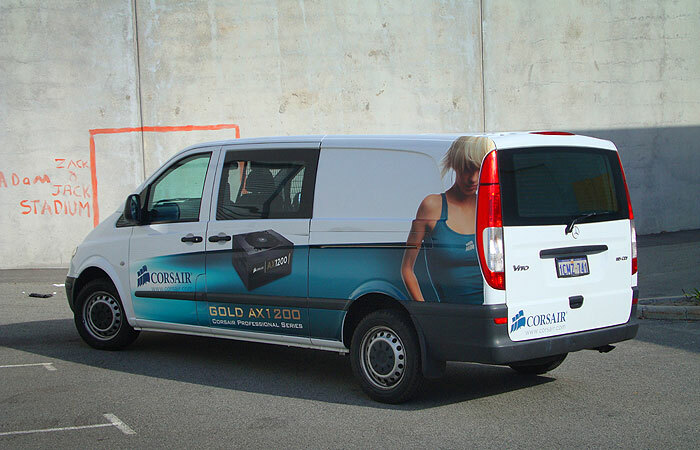 And if you’ve got a van to cover, then consider a car wrap. 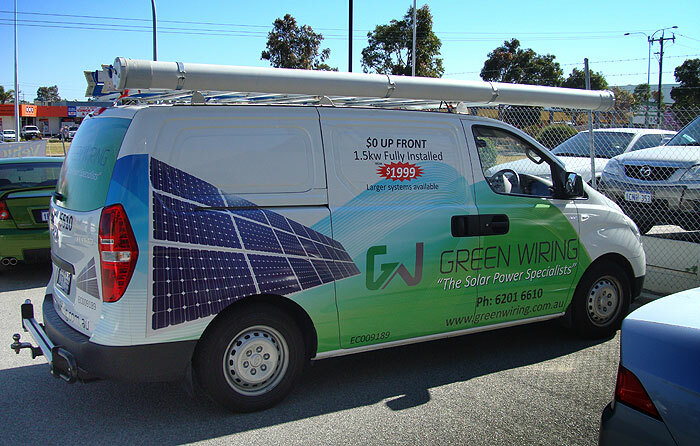 Using high performance UV resistant vinyls, heavy duty overlaminate, outdoor grade inks and decades of fitting experience means your van wrap will stand out and last for years to come. Email us a photo of your van and ask for a quote today. Yet again, Perth Graphics Centre, WA’s most progressive sign shop, has been employed to transform a plain white Hyundai iLoad into an eye-catching billboard. Rather than a full vehicle wrap, West Coast Solar went for a half vinyl wrap, to fit in with its budget. 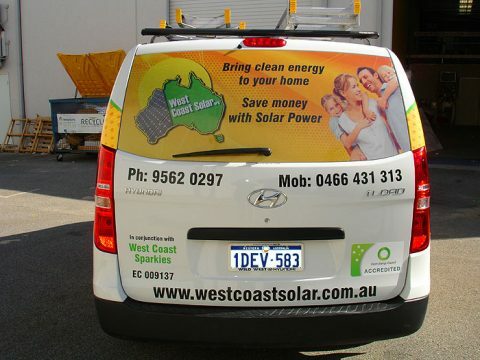 The result is a stunning piece of signage, and cost effective in comparison to a Yellow Pages advertisement. If you’ve got a van that you’d like to spruce up, then head to our contact page and ask for a quote. 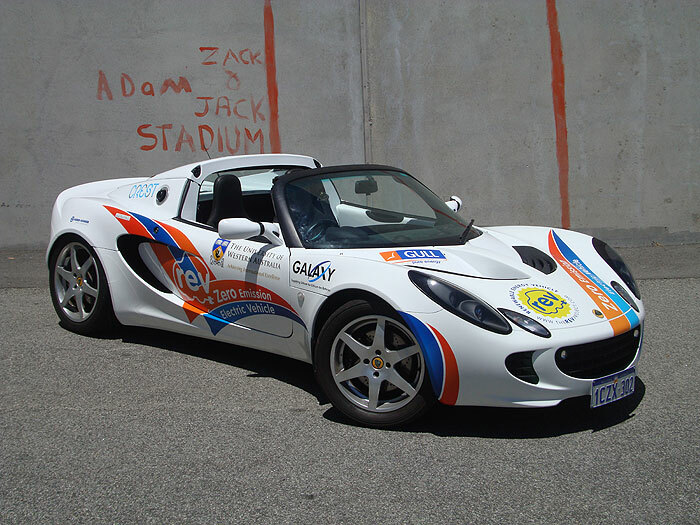 The University of Western Australia approached Perth Graphics Centre, WA’s leading sign shop based in Malaga, to turn a tired Lotus Elise into an eye-catching vehicle wrap. 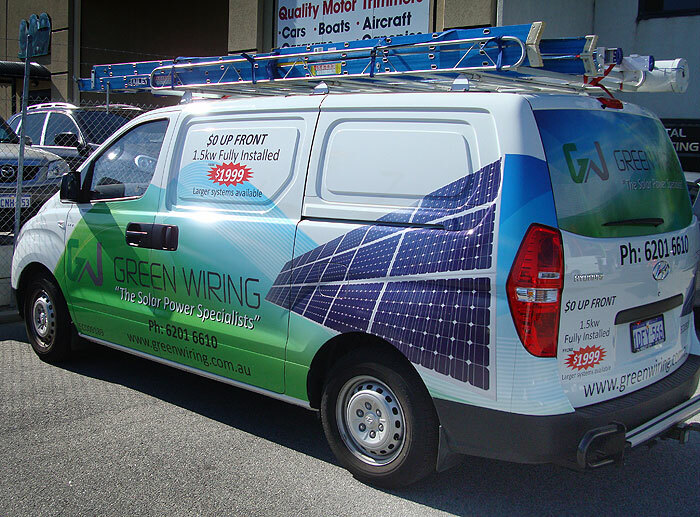 Using premium vinyls and printed graphics, we were able to slowly cover each panel until the whole car was wrapped in white vinyl. We then added the graphics and what you see above is the result. Plenty of man-hours were put in, but the results speak for themselves. Again, thank you very much for all your time and effort. 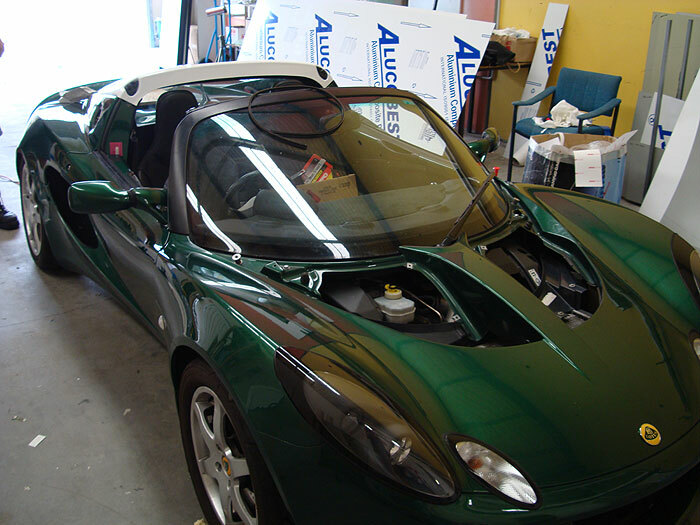 Click below to see the process of turning a green Lotus Elise into a white one. 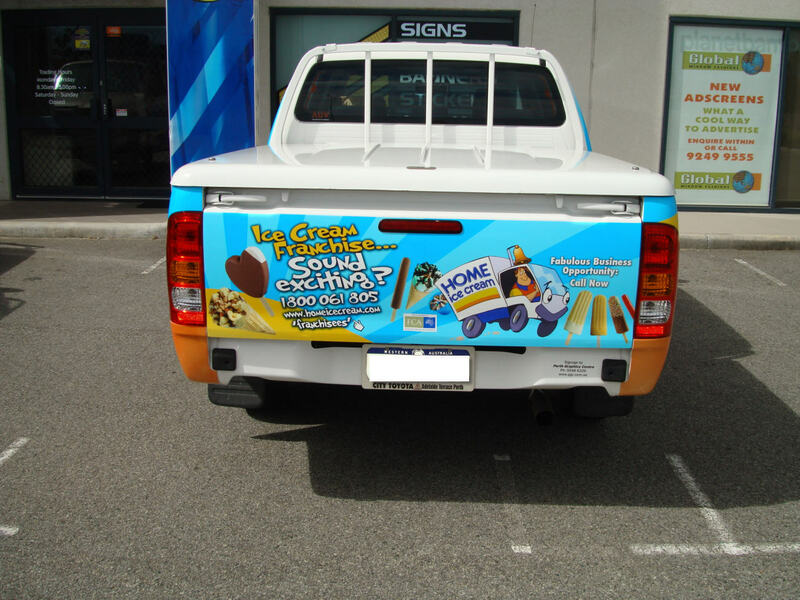 Vinyl wraps are all the rage with business owners, as it provides a moving billboard at a fraction of the price of a Yellow Pages advert. Plus, it’s in the consumer’s eyes constantly while it drives around. 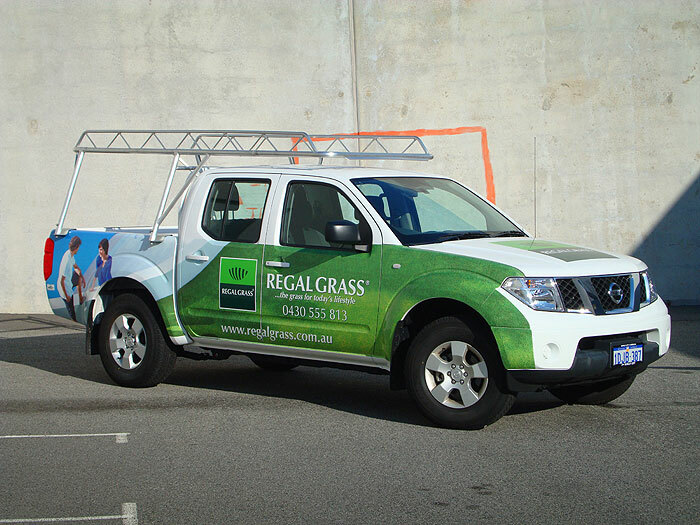 Here’s a Nissan Navara that we wrapped for Regal Grass, a high quality artificial turf company. 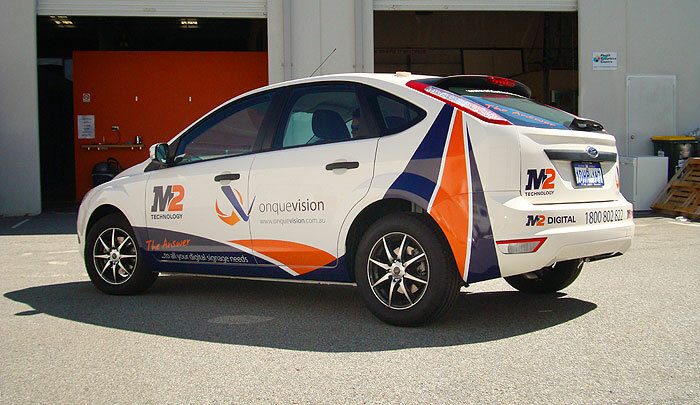 Using a high quality conformable cast vinyl with a protective overlaminate, we’ve been able to produce a three-quarter wrap which is both eyecatching and informative. Pricing on a vinyl wrap is coverage dependent, so if you want a half, three-quarter or full vehicle wrap, head to our contact page and ask for a quote. There’s signage, and then there’s signage. Here’s an example of how we can vehicle wrap a Hyundai iLoad, but really, just about any van can be wrapped. 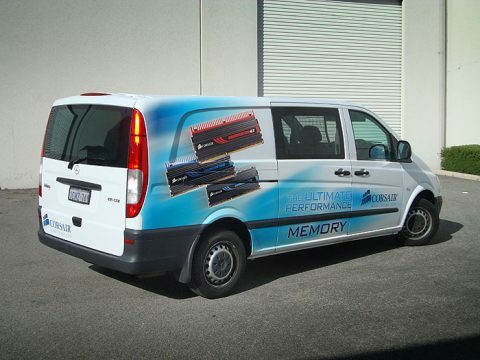 Mercedes-Benz Sprinter, Ford Transit, Toyota Hiace, Fiat Ducato, Volkswagen Transporter, Volkswagen Crafter – any of these can be vehicle wrapped with great success. 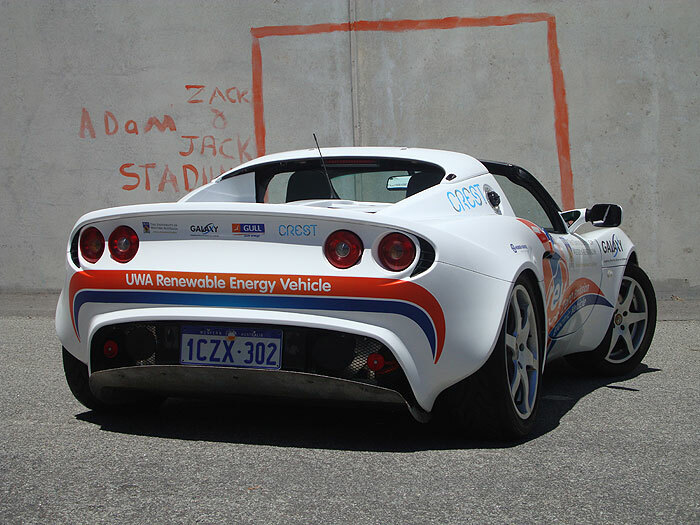 We’ve used a special vehicle wrapping film, which has been overlaminated for extra durability, while the rear window has been covered in Clear Focus one way vision film. 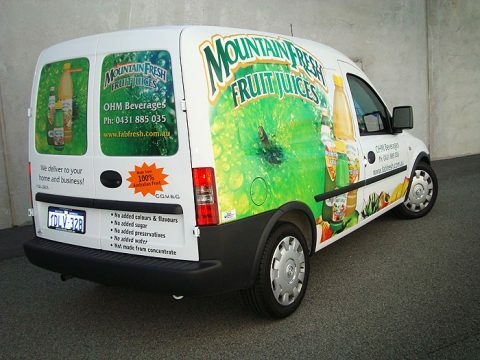 Partial wraps, full wraps, digital print or plain colours – we can do it all. 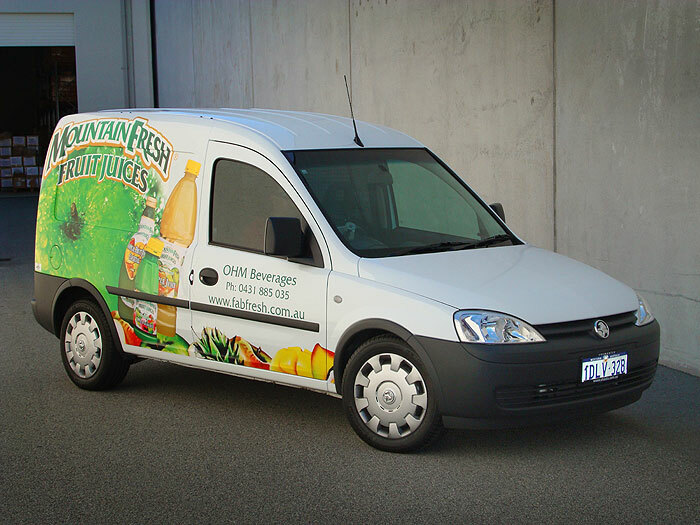 Vehicle Wraps – Half is still good! 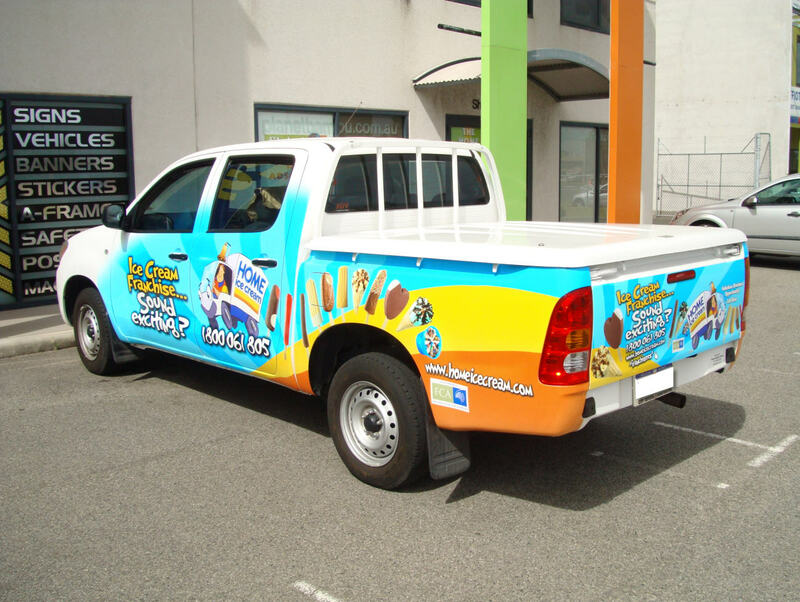 Our client was looking for great value and despite that full wraps are all the rage, sometimes a half wrap will provide just as much exposure but at a much better price. Why just wrap half a vehicle? Full wraps require removal of quite a bit of hardware including door handles, badges and more. 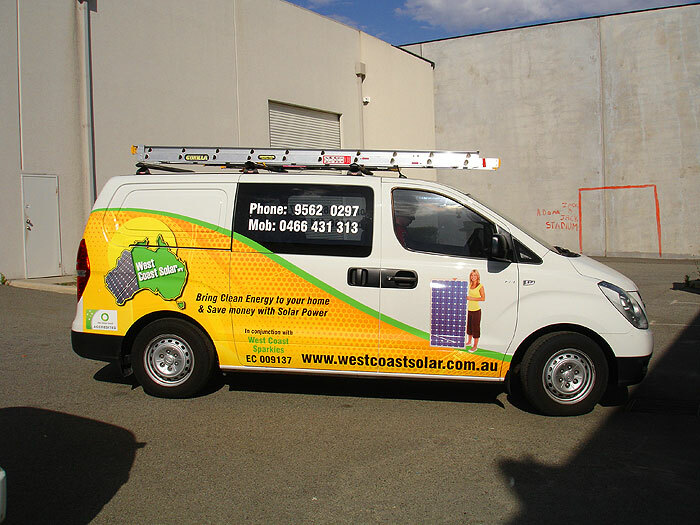 Wrapping only half a vehicle without removal of all the components results in a faster cheaper job and yet the exposure is almost as good as a full wrap. Value for money, a half wrap is pretty hard to beat. The same materials as are used for full wraps are also used in this application. We use Automotive Grade vinyls and laminates and the images are printed on a high quality solvent printer to ensure long life vibrant colour prints. The overlaminate ensures that the print is not directly exposed to the elements and can’t be “washed off”. 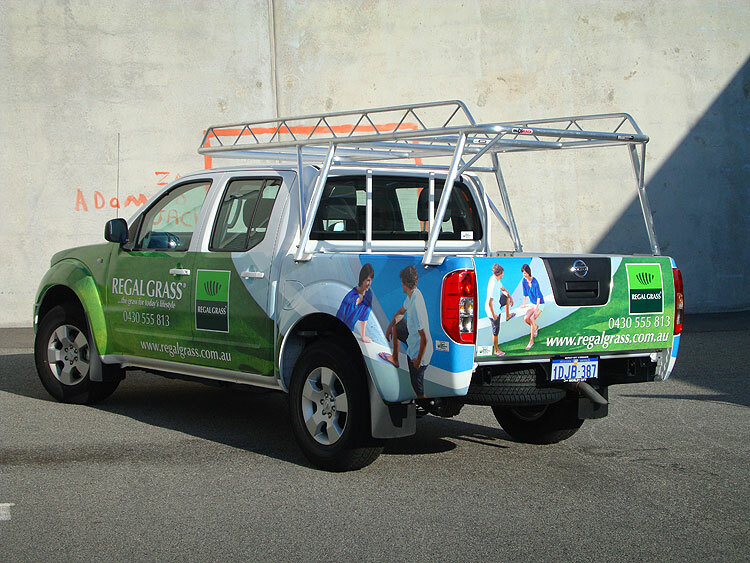 Our expert fitters have all completed training courses in how to wrap vehicles and are now very experienced in this aspect of signage. If you’re looking for maximum impact at minimum price, consider a half vehicle wrap. Call us today for an estimate.